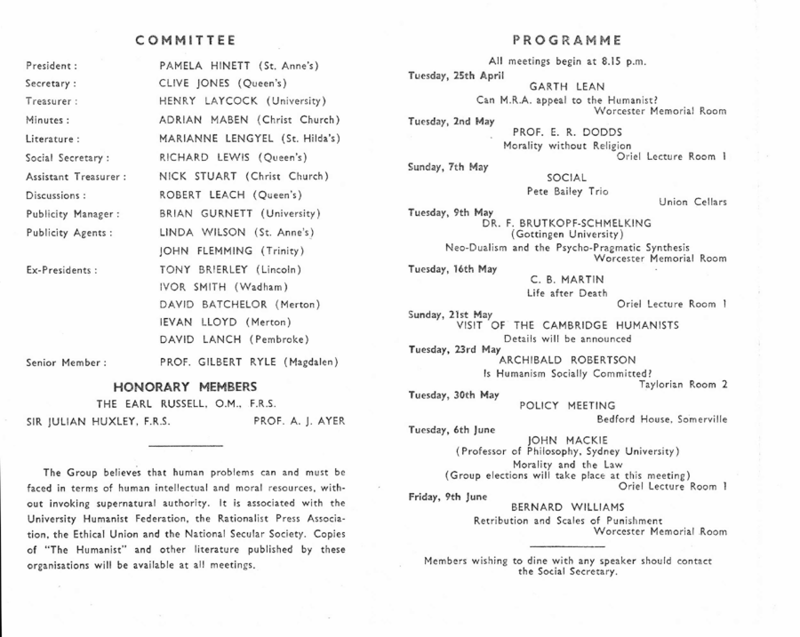 Ievan Lloyd was president, Connaire Kensit secretary and Roger Harding treasurer. 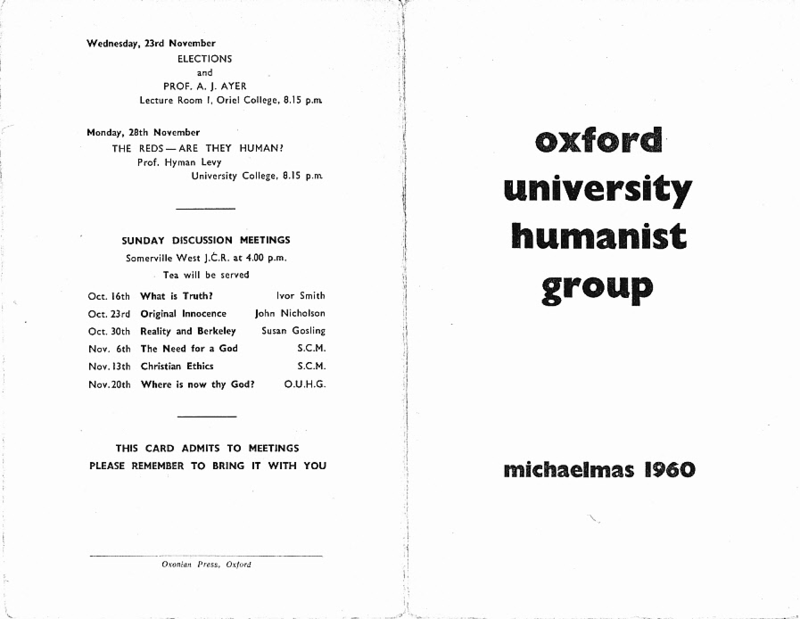 Speakers included Michael Argyle, A J Ayer and Hyman Levy. 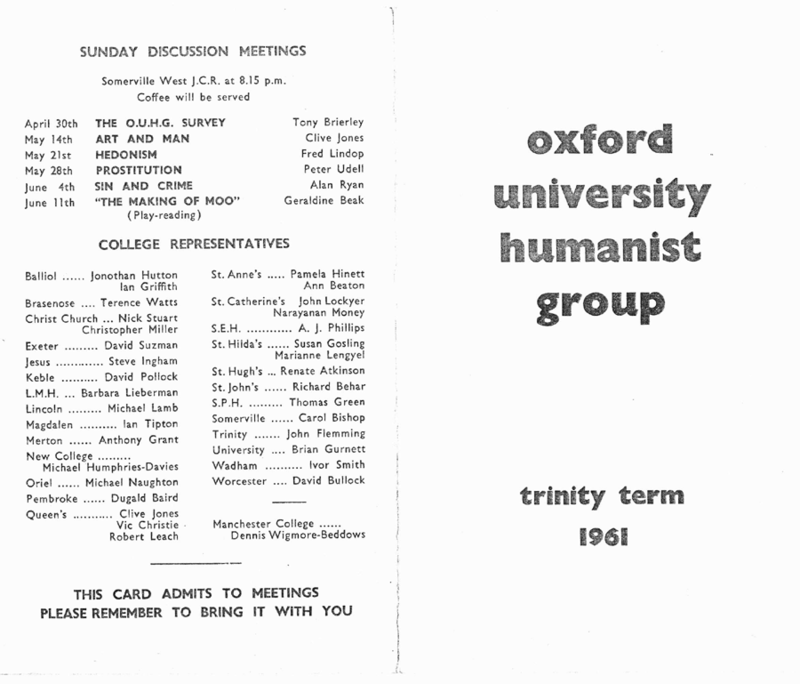 The Group carried out a survey of its members – see here. 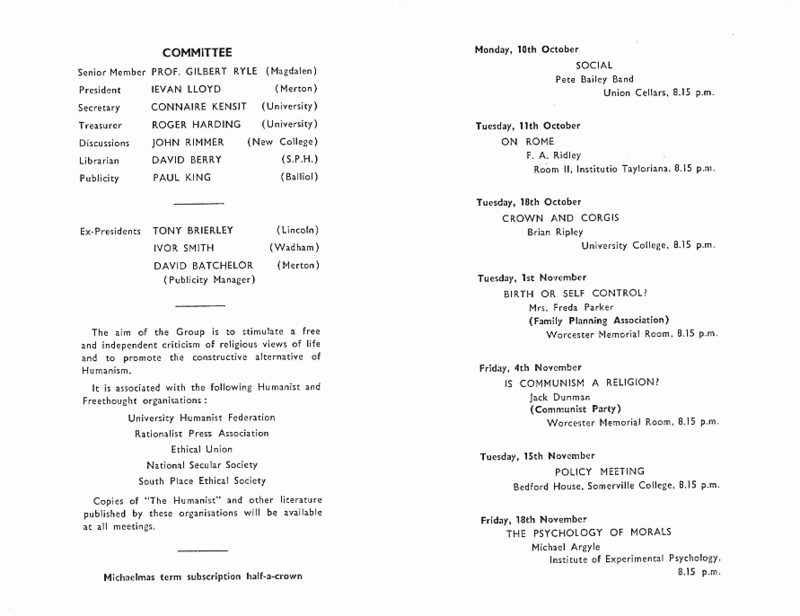 The OUHG Committee was highly suspicious of their scheduled speaker for third week, Dr Brutkopf-Schmelking, given his unlikely name and extraordinary subject and the fact that he was the only speaker who had been arranged by the previous term’s secretary, David Suzman. Suzman had been defeated in his candidacy for president in the previous term’s elections, contrary to the usual pattern that the secretary, who was responsible for fixing the programme for the following term, would then be elected president for that term. 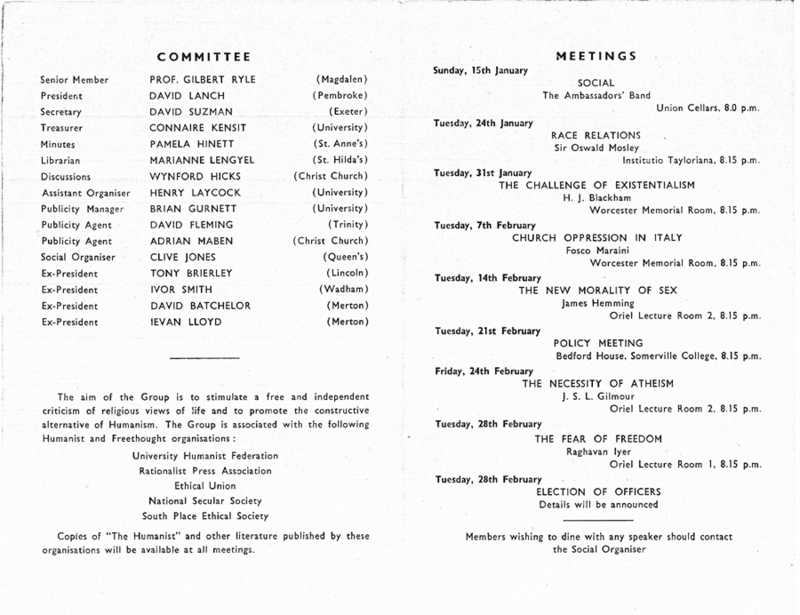 Dr Brutkopf-Schmelking had declined the usual invitation to dinner and was not expected to be on the nominated train from London – the Committee had arranged for Dr Raghavan Iyer from St Anthony’s to stand by as a reserve speaker. 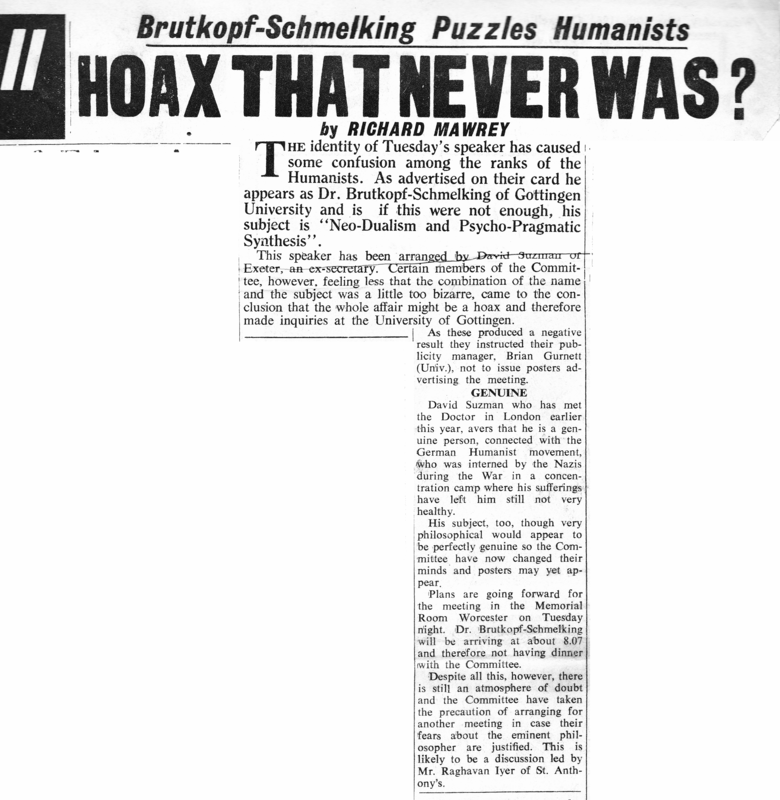 He was not needed – Dr Brutkopf-Schmelking was met at the station by David Suzman (no less) – though he was observed arriving on foot at the station rather than coming off the train. Wearing a trilby hat, a luxuriant beard and strong spectacles, limping and leaning on a knobbly stick, he was met and brought to Worcester Memorial Room where an audience of perhaps two dozen had been warned in advance of our suspicions. His hosts, still with a margin of uncertainty about his credentials (outright hoaxer or deluded madman? ), introduced him and he delivered in a strong German accent a fluent address of pastiche theology and philosophy of staggering virtuosity. 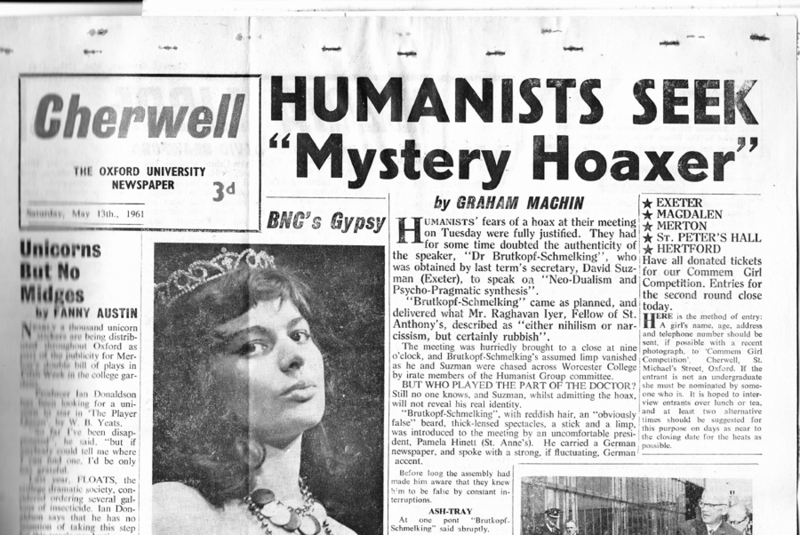 As the truth became certain, some in the audience held up to his view the Cherwell story. Glimpsing his notes, Pam Hinett in the chair saw that they were written out in phonetic script! 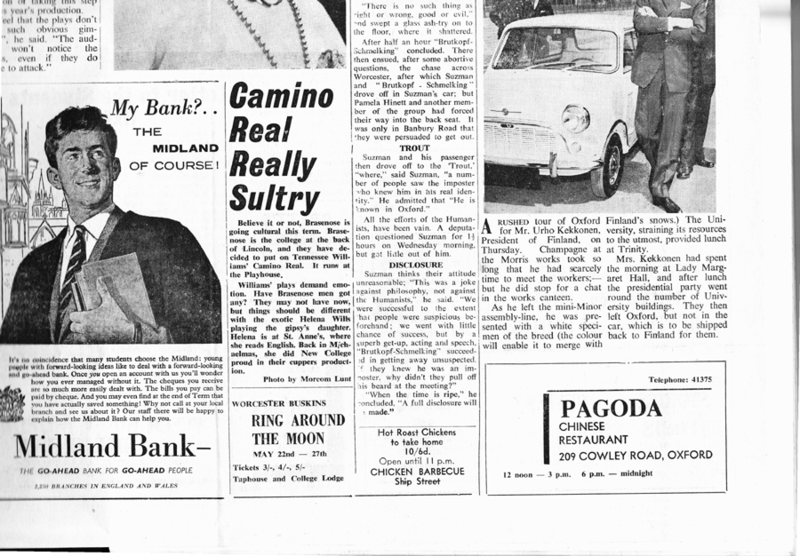 As the questions became increasingly sceptical and mocking he announced an urgent need to get back to London, and attempted to make good his escape, accompanied by Suzman. Finding himself pursued, he lost his limp, ran rapidly out of Worcester lodge and leapt into Suzman’s waiting car. The lead pursuers, the president and the college rep from Keble, managed to get into the car with him, only to be ignominiously ejected half way up St Giles! 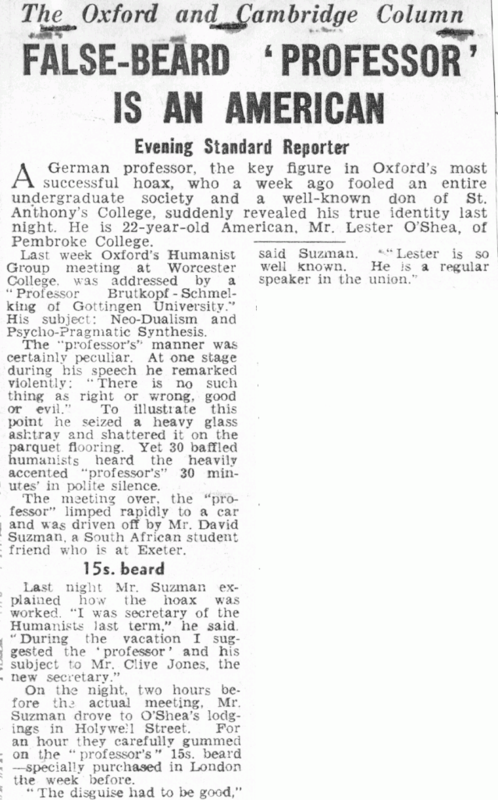 It was later established that the learned doctor was Lester O’Shea, a friend of Suzman’s and a prominent member of the Oxford Union Society. He and our ex-secretary David Suzman provided many of us with the highlight of the term! 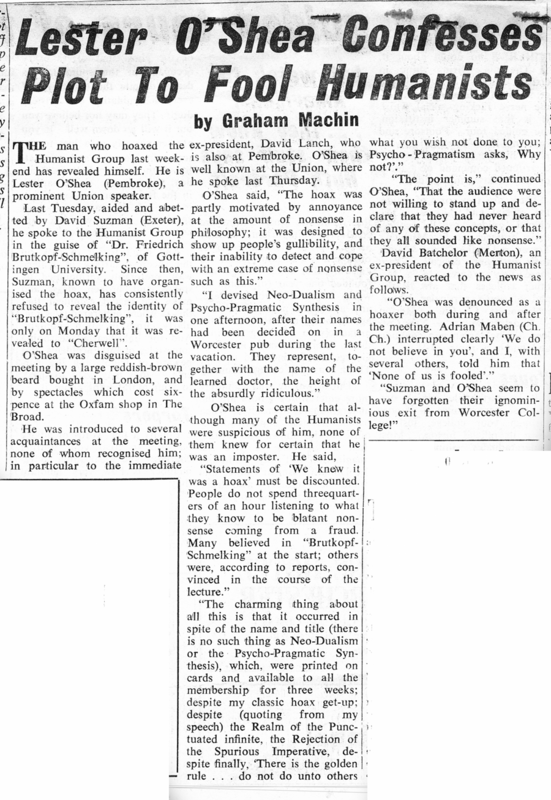 There were follow-up reports in Cherwell and in the London Evening Standard. Pam Hinett was president, Clive Jones secretary and Henry Laycock treasurer. 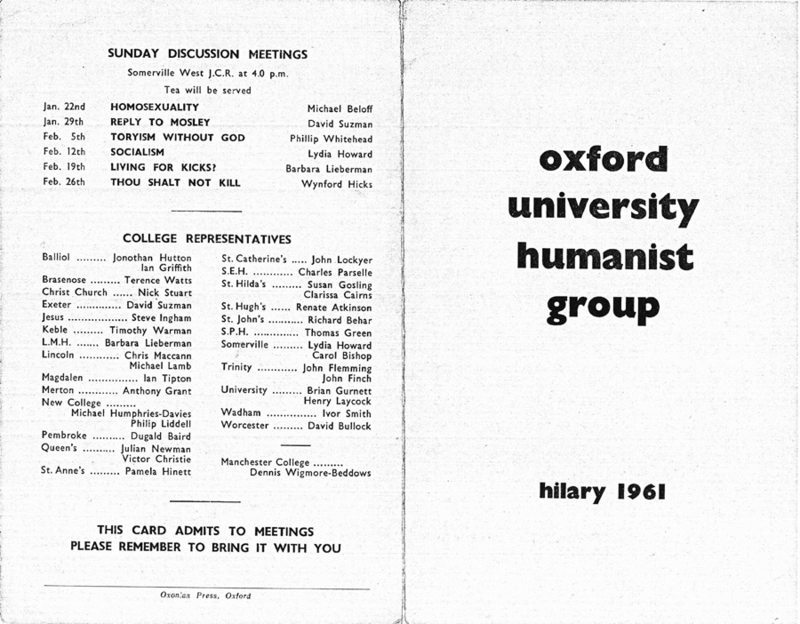 Speakers included Professor E R Dodds and Bernard Williams. They also included a suspicious-looking Dr F Brutkopf-Schmelking from Gottingen University speaking on Neo-Dualism and the Psycho-Pragmatic Synthesis – see more here! The president was David Lanch, secretary David Suzman and treasurer Connaire Kensit. A new constitution and standing orders were adopted. 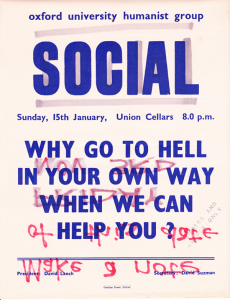 The only poster I can find for the term is this one for the social at the start of the term – its reverse used as scrap when I became Publicity Officer the following term!